A starship streaks by. Her lines are somewhat familiar — saucer, secondary hull with a navigational deflector, two cylindrical warp nacelles — but there are some details that are unusual — the saucer has a rollbar with a photon torpedo launcher, the neck also has photon torpedo tubes at its base, the warp nacelles have an extra sheath at the tips. The ship achieves orbit, and then we see that it’s not a single Starfleet ship pushing back the frontiers of human knowledge. No, it’s joining a battle fleet of similar starships — and some not-so-similar — as they begin an orbital bombardment. Yes, dear readers, the crossover I have long dreamed of — Star Trek/Legion of Super-Heroes — is finally here as the worlds of Gene Roddenberry and Otto Binder collide and DC Comics and IDW Publishing co-produce their first inter-company crossover! For the Legionnaires, traveling in a time bubble, they become trapped in a dark, alternate timeline when their bubble collapses. For the Enterprise crew, a transporter mishap throws them into the same alternate timeline, and separately both groups find themselves under assault. And somewhen long before the dawn of recorded history, a man with a glowing eye may plan to disrupt the evolution of Homo erectus. This first issue is almost review-proof, as it spends its twenty-two pages establishing the set-up and characters, which makes it hard to judge. For that matter, the plot has barely kicked in, and the two groups of hero characters — the command crew of the Enterprise and six Legionnaires — haven’t yet met by the last page. The story set-up is derivative of stories like “Mirror, Mirror,” “Yesterday’s Enterprise,” “Time Crime” (DC Comics’ Star Trek #52-57), the Glorith reboot of Legion, or even JLA/Avengers (which affected neither Trek nor Legion, but is a good parallel example). But that’s okay. 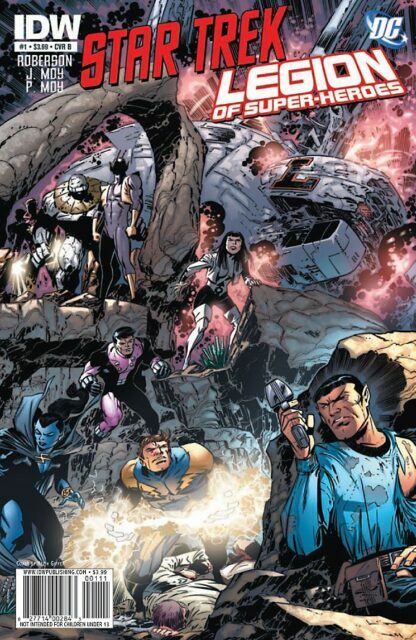 In this first issue, writer Chris Roberson shows his affection for both the Star Trek and DC universes, with an appearance by Admiral Komack on the Star Trek side, a reference to Darkseid on the DC side, and lots of little nods (like the appearance by Tommy Tomorrow or the modified Mirror Universe insignia to represent the Imperial Planets) scattered throughout. The familiarity of the story isn’t such a terrible thing; a crossover story like this is written for fans, so it makes sense to riff on familiar stories. And the artwork from Jeffrey and Philip Moy, who did some work for Wildstorm on the Star Trek: Voyager comics a decade ago, also displays some of its own “kisses to the past”; one page looks like something Tom Sutton would have drawn circa “The Mirror Universe Saga” (it’s the way the starships look), another page looks like it came from Mark Bagley’s artboards from his own Mirror Universe comic from Marvel fifteen years ago. The artwork is still lovely, though, and it’s nice to see the Moys drawing the Legion characters at an older age than they did on the Legion books a decade ago. The issue raises some interesting questions. Have two universes merged, or are the characters now in a parallel universe? (And I imagine that, in the Star Trek universe, the Department of Temporal Investigations would have something to say either way; there’s a fannish part of me that hopes that Chris Bennett can sneak a reference to this story into his forthcoming Star Trek novel, Forgotten History.) Who is the mysterious person with the glowing eye in the mists of pre-history? Future Guy from Star Trek: Enterprise? The Time Trapper? Someone else entirely? How are our characters going to get out of this predicament and get home? Suffice it to say, I enjoyed the first issue of Star Trek/Legion of Super-Heroes, and there’s no way I’m not on the ride for the next five issues. If Star Trek or Legion isn’t your thing, no matter how much I enjoyed it, this comic book won’t be your thing. But if you like either — or especially if you like both — this comic book is absolutely your thing, and you should run out today and get this.